Remember the Chuck Norris Facts phenomenon that blew up several years ago? "Chuck Norris doesn't read books; he stares them down until he gets the information he wants." "There is no theory of evolution. Just a list of creatures Chuck Norris has allowed to live." "Chuck Norris doesn't sleep. He waits." I haven't heard much about the Norris craze lately, so I assumed it had blown over. Turns out I was wrong: it just blew over to Croatia, as I learned recently from Neatorama. Erm. Apparently their definition of "life-sized" differs slightly from mine. Also, check out the "no hacksaws" sign. [blinking] Uh, guys? What exactly is going on in Croation bakeries these days? I mean, are people seriously shopping for cake while packing sawtoothed metal?? At any rate, the pint-sized power-house's photo seems to be working: employees claim they haven't had a robbery in over a month, which they attribute to would-be thieves' "respect" for Chuck Norris. Sure, that could be it. Or - and I'm just throwing this out there - perhaps thieves "respect" hacksaw-packing nut jobs jonesing for some carbs. Just a thought. This suddenly reminds me of one of my favorite Facebook decorations I've ever seen: "If Edward Cullen and Chuck Norris fought, Facebook would explode." Maybe the "no hacksaw" sign refers to the legendary "prison cake" which includes a file baked into said cake, and is then snuck into prison. I'm betting this bakery is right around the corner from the country's largest impoundment, and they're sick of baking hardware into their works of art. Oh, and i guess someone was trying to get the idea across that Chuck has some pretty cracked skin, but I agree, he does look like Mr. Grimm. Just when I think you've posted the funniest thing, along comes another. And the bakery. Even more classic! Okay my curiosity got the best of me. I just had to know what exactly the sign said. So I went to a translation site and found that the best translation I could get of the sign is : This parlor is under the protection of Chuck Norris. I have never understood the whole Chuck Norris phenom. And that it made its way to wrecky cakes...UGH! Chuck Norris "facts" are alive and well in World of Warcraft as well....so sad. Chuck Norris decorates his cakes with chainsaws and testosterone. I think Chuck Norris is freaky enough in real life... to put him in cake form makes the cake inedible. And that's a crime! I thought that sign meant they'd be happy to bake a file into the birthday cake for your favorite convict, but a hacksaw was going to far. I love the Chuck Norris stuff, pretty funny! I cannot believe this! Our 15-yr.-old son has been (over the last few months) throwing out some Chuck Norris stuff at me. I didn't get it. I still don't get it. I'd never heard of it before, and all I ever say to him about it is, "Why?" He says that there IS no "why," and THAT is "why." But that doesn't explain the sign in the window of a store that is presumably run by actual adults. And what DO they have against hacksaws, anyway??? OK, I was dying with laughter over the whole armadillo - dinosaur confusion (sorry, please excuse the Texan in me), but then I got to the Croatian bakery. I didn't think anything could top the armadillo and the resulting commentary, but that did. Word verification: lablin. 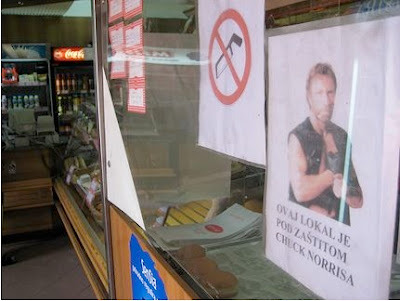 The Croatian bakery is lablin their goods "under the protection of Chuck Norris." The first cake isn't a wreck to me, as long as the recipient likes the humor. It certainly looks tasty. I admit it: I still enjoy many goofy Norris cracks. By which I mean jokes, not the visible cracks in his face. I would never eat a representation of his face. He might do a number on mine. Chuck Norris doesn't use yeast in his cakes. He wills them to rise from deep within his soul. Am I the only one who looked at the armadillo cake and thought of Steel Magnolia's? Too bad it doesn't have gray icing over a red velvet cake with a creepy lady serving it. Aw man! My husband and I were in Split, Croatia at the end of March! I wish we had seen that bakery! For the record, Split is a really beautiful place..in fact, most of Croatia is gorgeous. I thought it was an armadillo, too. Do they lay eggs? I think the real question is... why is not having a bakery robbery in a month some great feat?!? Are theives now saying, late at night, "you know... I could really go for something sweet... I'm gonna steal me some cake"!?!? And clearly the hacksaw is so they can say "step back or the cake gets it!"... or maybe they just want to steal half a cake. You know, because they're dieting thieves?!? You just know I'm going to use one for my next cake-cutting. Surely they're onto something? WV: endednay: "Ended? Nay, this is just the beginning of Chuch Norris cake protection." Why would you ever want to eat a cake with Chuck Norris's face on it??? These make me laugh SO much! I bought my oldest a t-shirt that was just a giant picture of Chuck's face during that whole thing. He loved it. "Chuck Norris "facts" are alive and well in World of Warcraft as well....so sad." Ahhhhh...okay, then; that explains it for me. That (W.O.W.) is yet another thing about our son that I do not "get", although he claims that he is going to be a "PROFESSIONAL GAMER" when he is out of school. Shooting for the big money. He can support me AND Dad! Now I'm getting depressed--someone cut me off a hunk of that Chuck cake, please--the chocolate one, not the head one. And while I'm at it, I may as well ask: If C.N. eats dinosaur eggs instead of Easter eggs, does he at least COLOR them first? I'm guessing the Chuck Norris head was made useing a white chocolate English style Easter egg, like this - http://s3.envato.com/files/85828.jpg which explains the texture. wv: hooff. Where is that equine cake entry when you need it . . .
lol Chuck Norris in cake... yeah who would have ever thought. I'm putting together the whole "groom's cake - armadillo - Texas - Walker, Texas ranger - Chuck Norris" thing in my own head. But I'm not sure wedding receptions are the place for word association. Haha, I live in a country bordering on Croatia (okay, so I may not be ~completely~ qualified to speak on behalf of Croatians), and I can assure you Chuck Norris is neither new nor particularly exciting to this part of the world. Stranger things have happened in these parts, really. That Bruce Lee statue in Mostar, Bosnia and Herzegovina comes to mind, for instance. I have no idea about the hacksaw, though. Type "Find Chuck Norris" into the search. just think of the headlines. Wow, the top one looks yummiful! this is just the first step, next he'll be president of Texas, and then the world. Personally, I think Chuck Norris is overrated, and idiotic for saying he'd run for president of Texas. Maybe he should eat that armadillo "egg." Oh, that silly Chuck Norris. If Twilight can be translated into a billion languages, so can he! Finally! I'm sure he's a nice guy but he's not worthy of being the focal point of an internet meme that won't die. He never was that great of an actor, he's one of those people who thinks YOUR children should be taught HIS religion in their science class, and he writes a column for world nut daily, nuff said. Let him write his raving column in peace so I can ignore him. I don't know, maybe it's similar to the sign I saw on a bus in Switzerland. It has a guy with a hacksaw attacking the seat...there wasn't a no slash over it though..hmmm. When Chuck Norris says, "I want sprinkles," he means gunpowder. When Chuck Norris is President of Texas, christening cakes will read, "Welcome to the Chuck Norris World." Chuck Norris single-handedly saved El Paso from an invasion of naked Mohawk baby carrot jockeys. The last person to make a cupcake cake of Chuck Norris...was the LAST person to make a cupcake cake of Chuck Norris. Chuck Norris doesn't decorate cakes...he frosts them with an icy stare. The Boogyman checks his closet for Chuck Norris. So, where's the wrecky entry for "Jack Bower" facts. The "Chuck Norris" stuff is old news, replaced by the same silly one-liners about Keifer's character who has a really bad day once each year. ... So Jen? How 'bout it? Any "24" wrecks? WV: "pullyzat": Pully Zat lever to get more cake. also. i frequently threaten to roundhouse kick someone in the face.. The sign says "this store is under the protection of Chuck Norris"
And yes, even though they've obviously known about him for years, the whole "Chuck Norris facts" phenomenon has just recently come to ex-Yugoslavia. My Serbian friends think it's hilarious. More hilarious though, as someone pointed out, are the Bruce Lee statue in Mostar and Jackie Chan statue in rural Serbia. Look it up, it's all true. take heart, a friend of mine has turned his gammer obsession into a very nice job as the head of a test group for blizzard (a major game company). makes a rather nice living at playing their games all day with the intent to find the bugs. the way he tells it: "Sweet." This is too funny- thanks! Chuck Norris sleeps with a nightlight becausee the dark is afraid of him. I cross that off as a holiday destination as wouldn't survive a break without a cake or patisserie here and there. You don't eat the Chuck Norris cake. The Chuck Norris cake eats you. Just for everyone information, you can't buy cakes in Croatian bakeries (yes I live here). Oh my, this Chuck Norris thingy is cracking me up. Thanks for the post! I wouldn't mind getting the first cake for my birthday, minus the Chuck Norris banner, of course. I'm not sure about the hacksaw sign. Maybe it's an ad; "Our cakes are so soft, you'll never need a hacksaw to cut them!" Cake Wrecks hasn't made me LOL in awhile but today... Well it made me laugh so hard I sprayed Diet coke out my nose... Made me remember why I liked this blog in the first place. Wow, that bakery is "Every Which Way But....logical? I want chocolate cake now. So I can go burn off it's calories on my Total Gym. 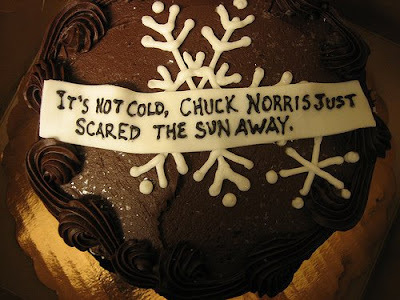 Love the Chuck Norris cake about sending the sun away. And so appopriate in "Sunny" Alberta where it snowed today. That's right people snow in May. He really deserves a bit better than what he got with those cakes. But I will give kudos that his legacy lives on. Been wanting a Norris t-shirt...had no idea I could get him in cake form! And we should all put those signs in our windows. Crime would disappear!! "Chuck Norris doesn't wear a watch. HE decides what time it is." How can you not love this stuff? Hilarious! Guys, I mean, who hasn't found themselves outside a bakery, hacksaw in hand? You're hungry because, well, hacksawing is darn laborious. What's the issue, here? Don't deny your inner-hacksawer. And any cake with Chuck Norris on it (with or without nunchaku) is a cake for me. Hyah! Chuck Norris doesn't frost cakes. He stares at them until they freeze. Maybe the hacksaw sign means "we don't sell sliced bread". I thought the "no hacksaw" sign looked more like a razor. You know the kinds people cut hair with? Maybe the bakery is just saying "we won't put razor blades in your cake, we promise". It's very considerate of them, really. I didn't know anything about the chuck norris facts, but I DO have an aunt who is a chuck norris fan. About the armadillo cake: in one of the MIA movies (missing in action where the government says there are no more POWs in vietnam and he goes back and rescues some), Chuck Norris is tortured by being hung upside down by his feet, his hands are bound, and a bag with a rat is tied over his head. There is violent thrashing, and then he hangs still. When the bag is untied, his face is severly scratched and cut, and he is holding the dead rat in his mouth. I saw that movie at my Aunt's house around 20 years ago. So I am pretty sure that the creature is a rat. Judy is right. The sign says its under Chuck's protection. Best part is the people that come in asking for his autograph. "the head of a test group for blizzard (a major game company)." Yeah, that would be a sweet job - Blizzard is the creator of World of Warcraft, my drug of choice. My hubby and I play, a lot, and he is starting school with the dream of working at Blizzard one day in game development. That's not airbrushing on the cake - it's blood spatter from when Chuck Norris roundhouse kicked the wreckerator. Eh - that's awkward. Anyone want to help me clean it up? That second picture looks more like Tommy Chong than Chuck Norris! "... a friend of mine has... a very nice job as the head of a test group for blizzard (a major game company). makes a very nice job as the head of a test group for blizzard (a major game company). makes a rather nice living at playing their games all day with the intent to find the bugs." GET ON THAT GAME and PRACTICE!!! When did using Don Knotss's picture to scare off burglars go out of style? Man, when I first saw the Chuck Norris photo and the reflection on the glass I could have sworn he was holding a lightsaber. Which would have been extra awesome. "You don't eat the Chuck Norris cake. The Chuck Norris cake eats you." AWESOME! That needs to be a shirt, with the cracked Chuck Norris head next to it! I wonder how many robberies that bakery had before Chuck Norris's "life-sized" picture started protecting them. If I owned a bakery and it was rare to go a month without a robbery, I think I'd need more than a picture to feel safe (my own hacksaw, maybe). Look , you got me so excited that I copied your comment in a very flubbed-up way. way. way. unrelated to the Chuck Norris cakes but Cakewrecks was mention on Woot.com as one of their favorite time killers. I thought it was a cell phone. As in, "No camera phones, please. We don't want to end up on Cake Wrecks." It's a hacksaw? (Tilts head) OK, I guess I can see that. It makes SO much more sense now! Swords don't kill people, Toshiro Mifune kills people. The Chuck Norris facts phenomenon is alive and well. Actually, there's a book out now with Chuck Norris and Mr. T facts. Funny stuff. Chuck Norris facts are still funny and will be until the end of time. "Chuck Norris can divide by zero." So that's where the Chuck Norris thing started? Aw, I saw the headline and thought you'd be posting the Norris portrait cake I sent you awhile ago... alas, no. Those things actually look like ROUS's...Rodents of Unusual Size! I ran into Chuck Norris about 20 years ago while he was touring his chain of martial arts studios. I think that picture IS life size. to say he is short is like saying these cakes of him are strange. haha so funny! i love this blog! Perhaps the bakery is advertising that you don't need a hacksaw to cut their bread, cakes, etc.?? Awesome! And i am randomly going to Croatia and the surrounding area this summer! I wil SO be looking in the bakeries windows! I'll be sure to email pics if I find some truth to this! Can't believe you missed this fact, as it is cake related..."Chuck Norris once ate a whole cake before his friends could tell him there was a stripper in it." There is also a Facebook app that gives you a new fact every day. Watch out if you have kids, though...some of them are NOT PG. I used to work with a guy who was marrying Chuck Norris's niece. I really wish I still had his contact info, he'd get a kick out if this!!! Awesome... that's all I have to say about that! Found this while on facebook. Superman wears Chuck Norris pajamas to bed.